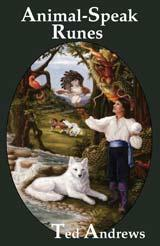 Ted Andrews Animal-Speak Runes is a book and rune divination kit. This kit contains 40 animal runes, inscribed on pinewood – along with the animalâs name and meaning. The book describes how to use the runes for insight, divination and answers to everyday situations and questions. Boxed set includes 40 wooden rune-like charms, 128 page guidebook and a carrying bag for the runes.